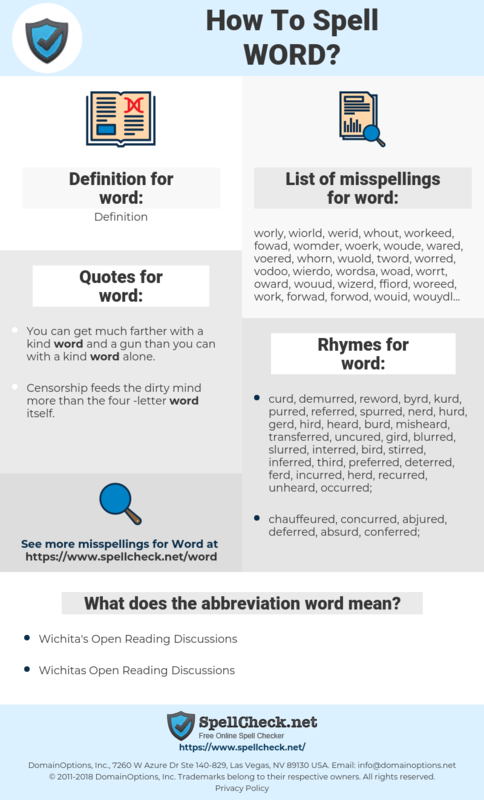 What are the misspellings for word? What are the common mistypes for word? What does the abbreviation word mean? What are the quotes for word? What are the rhymes for word? What are the translations for word? What are the common typos for word? This graph shows how "word" have occurred between 1800 and 2008 in a corpus of English books. Censorship feeds the dirty mind more than the four -letter word itself. Atheism is the last word of theism. It is hardly fair to accuse us of ignorance when it was made a crime under the former order of things to learn enough about letters to even read the Word of God. 字, 词, 词汇, 语词, ORD. exprimer, terme, expression, formuler, promesse, rumeur, libeller, paroles. Bericht, Versprechen, Formular, Nachricht, formulieren, Aviso, Begriff, Datenwort, Orden, in Worte fassen, Parole, Termine, Wort, Vokabel, Losungswort, Maschinenwort. 単語, ワード, ことのは, 言, 言の葉, 伝言, たんご, でんごん, ことのえ. expressar, escrever, termo, palavra, redigir, vocábulo. redactar, expresar, enunciar, exprimir, de textos, palabra, denominativo, mensaje, recado, rumor, vocablo, frasear.